Taipei, March 7 (CNA) A university in Miaoli has issued an apology to its Filipino students and put forth offers of financial assistance, ranging from partial to full tuition scholarships with free room and board, after it was alleged that the students had been pushed into manual labor to meet their expenses. In a press statement, Yu Da University of Science and Technology (YDUST) apologized Wednesday for not "taking full responsibility" with regard to the wellbeing of its Filipino students. 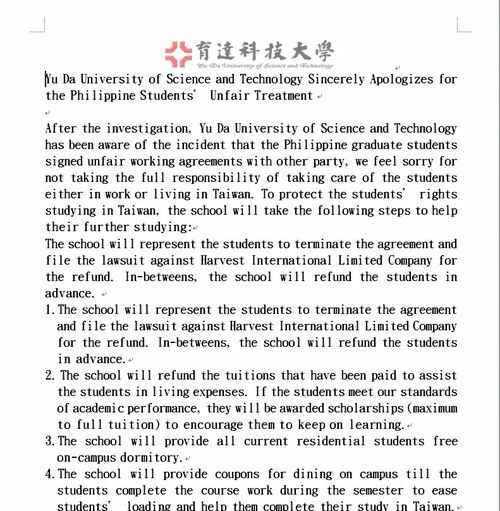 The school said it will refund the students the monthly fee of NT$2,000 (US$64.80) they had been paying to a recruitment agency, which reportedly was working in collaboration with YDUST to place Filipino students in factory jobs that exceeded the regulation of 20 hours per week for foreign student employment. 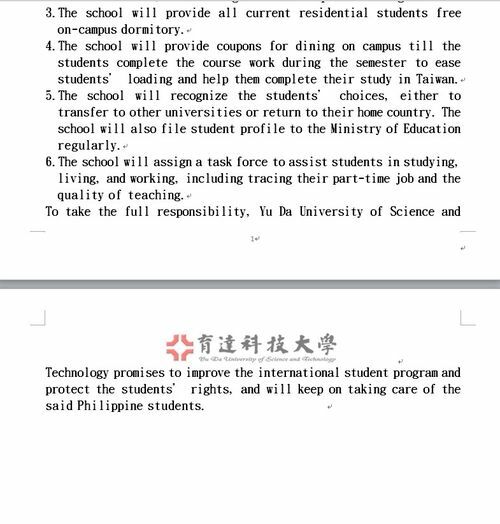 The Filipino students will also receive a full refund of their tuition and other miscellaneous fees for the previous semester to help meet their expenses in Taiwan, the university said. According to YDUST students, tuition and fees at the school amount to around NT$53,000 per semester on average. In its statement, the school said it was offering partial to full scholarships to its Filipino students, depending on their grades and attendance record, and will provide them with coupons for free meals at its cafeterias. In addition, YDUST said, it will waive the dormitory fee for Filipino students already living on campus. If any of the Filipino students, nonetheless, wish to return home or transfer to a different school, YDUST will offer them assistance to do so, according to the statement. In an effort to ensure the safety of its foreign students, YDUST said, it will record the information about where they are working part-time and will make on-site inspections. The offers of assistance and the apology came in the wake of accusations by three Filipino students at YDUST, who said at a press conference Monday that they had been forced to work up to 40 hours a week to make ends meet in Taiwan and to pay the recruitment agency that was collaborating with their university. Their charges mirrored those made in January by Indonesian students, who said the work portion of their work/study programs in Taiwan was simply a pretext to provide cheap labor to Taiwanese factories. Meanwhile, Yang Yu-hui (楊玉惠), director of the Ministry of Education's (MOE's) Technological and Vocational Education Department, said Tuesday that based on information provided by YDUST, the ministry does not believe the university was recruiting students through illegal manpower agencies. However, the university is not blameless because it failed to provide proper guidance to its foreign students, which resulted in them getting into unreasonable employment situations, she said. Consequently, YDUST will no longer be allowed to accept foreign students and the issue of the Filipino students will be investigated by prosecutors, Yang said. As of press time, YDUST said it had not received any official order from the MOE to stop recruiting or accepting foreign students. Currently, there are 347 foreign students enrolled at YDUST, according to the MOE website. Among them, approximately 52 Filipino students were involved in the allegations of excessive work, according to the information presented at the students' press conference on Monday.